PAPA BEING B.L.U.E.R. – Part 1 – LOGSsteemCreated with Sketch. There is great wisdom is being bluer. The way that I understand this concept is that the "green movement" can be very lacking. Though somepeople do horrible things that affect this world in negative ways, this does not mean that "*humans are bad and the earth must be protected from them." Rather than just eliminating and restricting all humans from interacting with the earth in the name of being green in an attempt to "save Mother Earth" we have a better option, being BLUER. When people take an appropriate stewardship over a portion of the earth, then they can interact with it in a beneficial way. They can live on the land and fashion it in a way that benefits the plants, animals, and humans. By doing so in a wise manner, they can build a legacy utilizing the earth's resources that have been entrusted to us. As I am currently working on preparing a driveway and a house site on my property, there is a lot of restructuring going on with the earth's surface. Everything that is being removed from this area will be used for other purposes to help benefit the homestead and the homesteaders. I do not desire to waste resources, but rather to use what I've got. Stay tuned as I share more about this mindset and project over the remaining three parts of this series. I have always bristled at those who act as if humanity is not as important and intrinsic to the planet as a tree, frog, or ocean. People who say that humans have overpopulated this planet, need to understand that practicing permaculture will prove that we are a benefit to the Earth. In fact, in order to bring balance back to some of the more degraded areas, we need MORE people, not less. When factory farming gives way to the techniques of Joel Salatin's, Polyface farming. The berms and swales, used by Geoff Lawton to green the desert. Aquaponic systems I am working on. People are not the problem. Corporations, greedy for a cheap buck are. Very good points. I like Joel Salatin a lot. I do to, he's no nonsense and pays attention to natural systems. Yup, he's knows that there is a design to this whole thing and a way that it is supposed to work. Also, I gave your first comment a 100% upvote because you made a real comment. I just want to reward proper behavior and let the spammers see how to properly interact. It can be rewarding! Thank you Papa-Pepper, I appreciate your kindness. It's good to hear these sentiments. I have my beliefs of the best ways to live with the land, but when there's always someone making you feel guilty for something it does sometimes make you question humanity. I love all life, but living inevitably means that something else living must die to sustain you, whether it be plant, fungus or animal. Yes we cause harm, but so do other things. As long as it's not so bad that nature can't fix it, then it isn't a problem it's a balance. Yes, I agree with that, and realize the cycle of life on this planet. Some of the people who say such things, are usually parroting someone else. Never thinking for themselves, in my opinion. Only humans have the capability to rehabilitate vast areas of deserts in one generation. Correcting the mistakes of the past. Mimicking natures process. I often think about the wasted resources of our planet, during the era of the cold war, all that money and material. What sort of world would we have, if those resources had been used to change mono-culture farming? 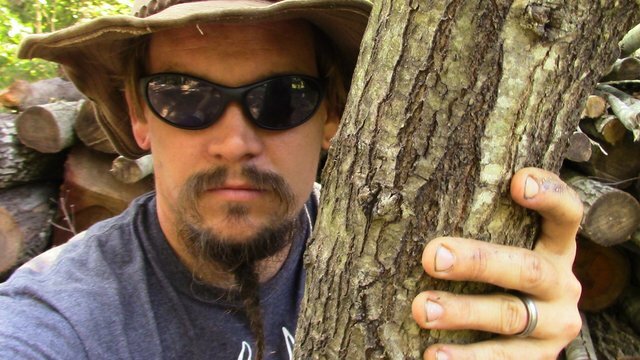 Using permaculture to build soil, instead of eroding it. Man I just spent a good hour reading and watching your stuff on here and plan to burn probably another hour. Outstanding content. Wow! Glad to hear that you think so. I had no clue what I was doing when I joined steemit, but now I have a year of experience at sharing and posting. I'll give you a 100% because you have given me so much of your time! Thanks for letting me know that you enjoy it! That red in your saw is blood?! No, leftover logo on the blade. 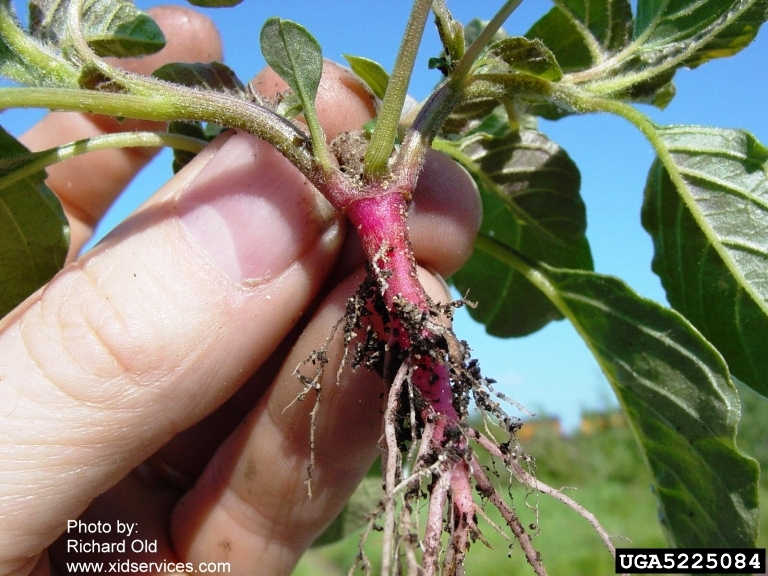 some plant roots are blood red! I like the way you make the most of whatever is available. That is a real gift. Upboat is a friendly half-human, half-robot which hopes to help promote the better posts of Steemit by trying to ensure they get the recognition they deserve. @UPBOAT looks for numerous signals before deciding on who to UPBOAT and is likely to summon our robot friends to share some robot love with you to show affection. I'VE BEEN AT SEA FOR 4 DAYS AND HAVE GIVEN 119 UPBOATS! 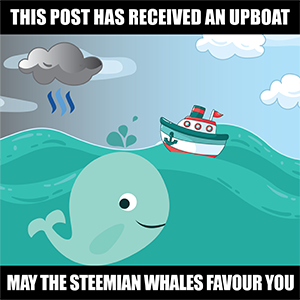 PLEASE HELP @UPBOAT STAY AFLOAT ON THE STEEMIAN SEAS BY DELEGATING SPARE SP OR PATCH WATER LEAKS BY UPBOATING. This post has received a 1.04 % upvote from @drotto thanks to: @upboat. I'd like to make hubby happy but I also don't want to go broke on a chainsaw that breaks the day after the warranty wears out either. Mine could be better. It is a Husqvarna. 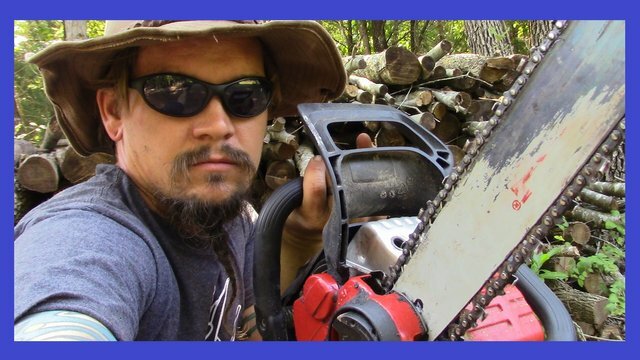 I heard that Husqvarna was a good brand for a chainsaw...if you think yours could be better, is there one that you would recommend looking into? What a lifestyle, have a great time. Ok we have to talk about getting you a REAL chainsaw, like a Stihl or a Husqvarna! That Homelite or Johnsred, whichever it is has gottsta (that's not a misspelling) go. I may have a wood stove for you too if you're interested. You can take a look at it next time your over. Not sure how big of a place you are building but I was told it will heat a 1500 sq ft home. Lol. Well I don't have a chainsaw but I've used them alot back in the day. I do have a wood stove made from cold rolled steel that I used last winter but don't anticipate needing for several years now so it's better to give it to someone who can use it. Interesting concept, I agree that some people in an attempt to be earth friendly might go a little overboard. Its always good to be conscious of your actions and how they affect others and the enviroment. Sorry. I just couldn't help myself...LOL I like the bluer movement because you are right about green. Everyone doesn't have the same idea about stewardship of their land. I want to be able to pass our land on to my children and grandchildren in better shape than we we bought it. Us too, to bless further generations. Cool. I've been building a livestock fence with pallets and a deck my buddy took down. It's free and I'm using wood that people were getting rid of. I really respect what you're doing out there @papa-pepper. It feels good to see people working with the land. It sounds like you are doing it well too. Keep it up! Papa, used to do firewood and heat my house from the forest wood. 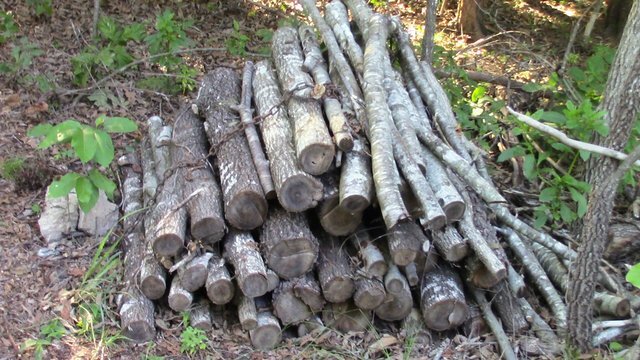 One thing with firewood, it's real simple, if you put a base under it of sticks, or something like that, just something to keep the firewood from making contact with the dirt, that firewood will last much longer, 2 extra years maybe. If you could keep it covered even, then it will last forever, tarp can do that if you have a tarp you don't mind being junk.. But if you keep it off the ground, you probably got a few years out of it before it goes bad. Firewood touching dirt though, goes bad pretty fast, 2 years, it loses a lot of weight and is broken down pretty well. I have some long metal pieces I'll be putting under it and I think I will even just screw scrap metal roofing into the top of it to keep it dry. Excellent advice! collaboration is important @gr3g0r Follow Me! You have the right attitude and I have no doubts you will make it happen and take us all along for the ride...Steemit community, wake up and see this happen! You will all be coming along for the ride! Thank you. Your one lucky man. Glad your getting ready to build your house if your using things the land provides at least your not wasting it. Thinning trees out of your woods is a great way to produce more. If the sun can't get to the smaller trees they can't grow' There is a big difference in clearing the land just to clear it and clearing sections for a driveway,house and to provide food for your family. You are correct. A BIG difference! Thanks! Sorry. I had a cheeky moment. @tybello... It is wonderful. It very important for all us to be bluer most especially at this period. Bluer is wonderful idea which i believe will promote conservation or reduce waste in our enviroment. Good one @papa-pepper. Oh yes, use it when you have it or you'll have to buy it anyways. more like papa PREPPER with all that firewood! Watch me dab, when i ride past, thats too much swag even on my hoverboard! Watch me steem when I upvote, thats too much steem power even with my delegation! Hey! Nice blog! following.. how do you process your human waste? This post has been ranked within the top 10 most undervalued posts in the first half of Aug 12. We estimate that this post is undervalued by $47.39 as compared to a scenario in which every voter had an equal say. Thanks for the shout out @papa-pepper. I enjoyed sharing my knowledge. Community that's what its all about! I hope to get down sometime and give you a hand!